Ants and aphids are symbyotic - when you have a problem with one you almost always have a problem with the other! That is because ants like to "farm" the little aphids for their juicy nectar. 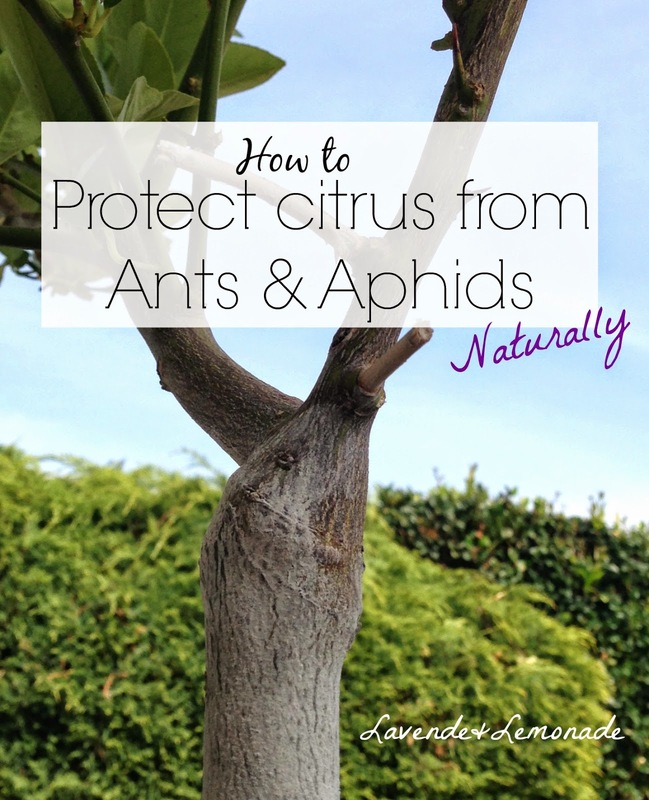 That juicy nectar comes from the aphids attacking the leaves and branches of trees, especially citrus trees. Which of course, is not good for the tree or its fruit. My kaffir lime tree and orange tree are for some reason a favorite of the ants-aphid combo, while the Meyer lemon and sweet lime tree tend to go unnoticed by the little buggars. No worries, because after a lot of trial and error I've found the perfect way to keep the ants off. And without the ants, the aphids can relax and stop attacking the tree so intensively. 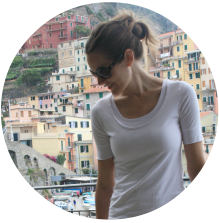 The solution for me has been food grade Diatomaceous Earth (DE). Not the DE from the swimming pool aisle (those are bigger crystals which don't work and can be dangerous for humans), but food grade DE. It is a natural mineral powder made of ground-up fossils that ants, and most other insects for that matter, can't stand. They instantly reroute and will not cross a line of the DE, or as we call it at our house now...Magic Dust. Food grade Diatomaceous Earth can be tricky to find, but is well worth the hunt. Most farm supply stores carry it, because farmers often feed it to chickens to help their digestion. A pound is only a dollar or so, so it is very economical! Home Depot and Lowes don't seem to carry it, at least not that I've found. To stop ants from crawling up the citrus tree, simply put a heavy dusting of DE onto the trunk of the tree. It should be spread onto an area a few inches wide, and all around the tree, so that there aren't any secret passageways for the ants where coverage was missed. The DE will stay effective as long as it stays dry. It needs to be reapplied after a rain or if it gets hit during watering, but otherwise will instantly stop the ants. Without chemicals, without insecticides, just with a physical barrier of "Magic Dust". Help! Diatomaceous Earth was not strong enough for my issue. This is In northern California and the drought has made the ants a NIGHTMARE here! They are worse every year. Still going strong inside my house when its 50 degrees out! They are coming up 3 floors to look for water in my bathroom when they should be deep in the earth for the winter. So my indoor very large kieffer lime tree brought ants in with it when it was moved indoors for the winter. Do you have any other ideas about ridding the plant of the scale ? We got the aphids off. Tried the drowning too... which helped a little. Terro bait traps are helping too, but still ants farming away on the tree. Next we are going to try cleaning all the individual leaves with alcohol and perhaps Neem, which removes the scale I read somewhere. Would I use Neem oil or soap? Hello! Uugh, sounds like a big mess... I'll let you know what's worked for me and hopefully you'll have some luck as well! For the scale, try scraping off as much as you can first. A little plastic knife reused from a fast food restaurant is perfect. Scrape it off as much as you can, all the little bumps. Then, for any live aphids that are still there, I use a little spray bottle that is mostly water and just a squirt of dish soap. Mix it up and spray it over the whole tree, especially anywhere where you see traces of the aphids. 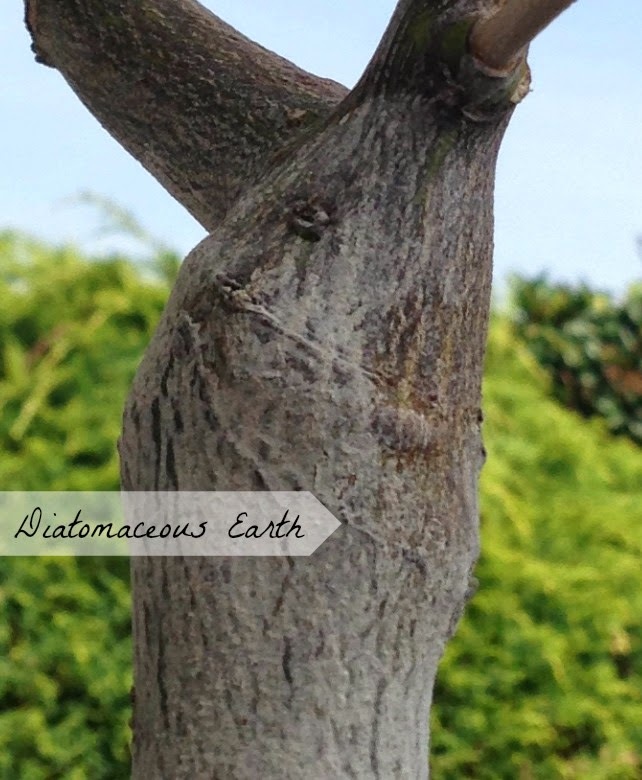 Then, use diatomaceous earth rubbed all along the stump of the tree. And onto anywhere that ants are still going. The DE works by making little micro cuts on their bodies, so you need a little patience for it to work. If there are tons of them, make sure they don't tramp down the DE and make a path for each other. For the ants in your house - they're so annoying aren't they! We're talking Argentine ants here I presume? If so, I've abandoned the Terro traps - they attract them in and around the house and kill the ones who drink - but their nests can be literally miles around so its just not a long term solution. Instead, barriers are the only way I've found to work. Once they're in - try to find the source and block it. Caulking, DE... Then go in with a damp paper towel to get all the intruders. Are they nesting in the lime tree's pot? If so, definitely put a little moat of DE around the pot so that they can't get past the tree and into your house! Good luck...I'd love to know what ends up working for you! I used to think that it is impossible to get rid of ants permanently, but my misconception was cleared after hiring pest control experts in Pretoria because they presented live example of eliminating all kinds of pests much easily.